The dynamics of politically motivated large-scale conflict against a central authority was studied using an agent-based model, which extends Epstein’s model of civil violence by including the mechanisms of “massive fear loss” (generalized vanishing of the risk perception), value-sensitive relative deprivation, legitimacy feedback, and network influences. The results of the computer simulations were discussed using analyses of conflict events in eight African countries affected by the “Arab Spring” (Algeria, Egypt, Libya, Mali, Mauritania, Morocco, Sudan, and Tunisia). It was shown analytically that the mechanism of “massive fear loss” can be represented via a form of the estimated arrest probability with a parameter that strongly influences the magnitude of the simulated events. The analytical results were confirmed via computer experiments which showed that this controlling parameter has associated tipping points. 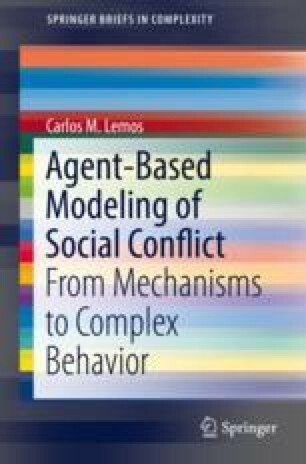 It was also shown that the model produces solutions with three distinct regimes—permanent calm, complex (i.e., with intermittent peaks of rebellion), and permanent rebellion—for low values of the legitimacy, typical of authoritarian regimes. A model of relative deprivation was proposed, with a parameter that controls the sensitivity to deprivation (for representing the difference between political and economic deprivation). It was demonstrated via computer experiments that this parameter strongly influences the stability of the solutions and has an associated tipping point. When combined with strong relative deprivation, endogenous legitimacy feedback does not change the qualitative behavior of the solutions. However, this mechanism induces instability and for certain conditions of high legitimacy and low level of repression leads to solutions with alternating regime (long periods of calm followed by periods of unrest). Network influences introduce instability in otherwise stable solutions, by greatly amplifying the magnitude and increasing the duration of the simulated conflict events. Instability increases with both the influence weights and the degree of connectivity, but connectivity has a larger impact on the magnitude of rebellion events than the influence weight. Future work can be developed in several different ways, such as time-varying social contexts, refinement of the model of network influences, or extension to ethnic and religious conflict.